I had to consider some issues in creating these lists. These 12 categories indicate the disciplines that most interest and influence me. I do not include numerous categories, such as politicians, psychologists, scientists, sociologists, and theologians, even though these categories have also had a great effect on my thinking. But some people from these disciplines appear under other categories. As examples, psychologist Mihaly Csikszentmihalyi, scientist Albert Einstein, and sociologist Edward T. Hall appear as essayists, and politician Barack H. Obama and theologian Martin Luther King, Jr. appear as orators. 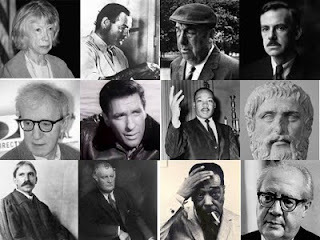 Also, I would likely place into two categories some influences, such as Duke Ellington (composer and musician), Harold Pinter (playwright and screenwriter), Robert Penn Warren (essayist and poet), and Allan Watts (essayist and philosopher); however, I limit these influences to the one discipline in which they had the greatest impact on me. On this blog many times before, I have encouraged voracious reading for finding inspiration, improving style, honing subject-matter expertise, and keeping a creative edge when dealing with writer’s block. Then why should I end this series on staying creative any differently? I have heard people say that reading is a passive activity. Maybe for passive types, but not for engaged readers and definitely not for writers, who find reading to be entertaining, educational, and, above all, a starting point for many of their creative works. Without having read Romeo and Juliet and The Tempest, Marc Norman and Tom Stoppard would not have written Shakespeare in Love, for which they won an Academy Award for best original screenplay. If there were no Virginia Woolf writing Mrs. Dalloway in 1925, there would not have been Michael Cunningham’s The Hours in 2002. Let’s extend this point to business. Without having good proposals as reading references, the proposal writer would have a far more difficult time crafting a persuasive message to her upper management. By reading high-quality trip and conference reports, the writer would not have a standard to emulate when reporting on a seminar he attended. You get it? Read. It’s a gift that never stops giving, whether you’re reading the newspaper, a magazine, or a book. It's a great way for a writer to stay creative. Who are my interviewees for articles, the characters of my plays, or the subjects of my poems? If they are always the same, I’m not expanding as a writer. To overcome this creative ennui, I'll try using any of the techniques I mentioned in the previous five posts. What are my genres, topics, and themes? If I write only nonfiction for long stretches, I feel stifled. While nearly all the income I generate as a writer is from nonfiction, shifting to drama for a short play or poetry for a verse or two occasionally brings me back to nonfiction with a fresh outlook, approach, and style. When do I write? I need to be as productive as possible at the time that I write, so I periodically must assess the best time of day for to work. Typically, I like the morning hours, but my consulting practice takes up most of my daylight time. In a busy week, I will schedule an early or late evening hour to write. Where do I write? My business office can be stifling with its clutter, so a change of scene can generate a burst of creative ideas. I’ll move to another room or to a library or to a coffee shop. When I'm on business trips, hotel rooms are great places for uninterrupted writing. Why do I write? Sometimes I write to explore creativity, or reveal a truth underlying an issue, or reflect on my own beliefs, or examine the consequences of an action by a person or group of people, among many other reasons. If I am repeating myself too much, then it’s time for a change. I'll often find the means for a change by reading, but more about that in the next post. How do I write? As I write almost exclusively on a computer these days, I notice a benefit from breaking away briefly for my old-fashioned notebook, where I sketch characters, layout scenes, and structure books, chapters, essays, or arguments. I might see something on the page that was hiding right under my nose on the screen. Try using the 5W&H to stay creative—and be open to changing your ways. You can compare writing prompts for writers like an automatic pilot light for a gas stove. Some of us prefer a wood burning stove for our heat. But we have to chop down the tree, split the wood, stack the bundles near the house, stuff the logs in the oven, light a match to them, stoke the fire, and keep feeding more logs as fire dissipates. So most of us prefer the ease of flipping a switch, turning a knob, or igniting the pilot light, and presto—here comes the heat for as long as we need it. We writers are the wood-burning-stove types. We have to get the idea, muster the inspiration, draft laboriously, revise paragraphs, edit sentences, change words, correct grammar, punctuation, and spelling, and probably somewhere down the line rewrite the whole darn thing. Writing prompts might ease the pain. If you do a web search on “writing prompts,” you’ll find a seemingly endless list of topics you can use as springboards for getting started in the writing process. They range from single words to paragraphs, from nonsense to insights. To have a way with words, you sometimes have to stay away from words. Walking away from words to your music player may soon bring you right back to the writing, refreshed and simmering with ideas. I would compare this momentary departure to going on a vacation from work and returning raring to go. Music is a great stimulator of creativity. American novelist Edmund White once noted, “I’ve never willingly written a word without listening to music of some sort.” Karl Barth, the Swiss theologian, would delight in the music of Mozart as he composed his magnum opus, the 13-volume, 8,300-page, 6 million-word Church Dogmatics. Many writers these days write with their headphones literally shooting music into both sides of their brain. I used to need silence myself, but I now find that listening to non-vocal music, especially my favorites—classical and jazz—while writing inspires energy and generates ideas. The next time you are struggling through a tough writing assignment, try listening to your favorite instrumental music and see if it helps move you along. But be sure that you’re not distracting others or blasting out your eardrums.